Pop art is an art movement that emerged in the mid 1950s in Britain and in the late 1950s in the United States. Pop art presented a challenge to traditions of fine art by including imagery from popular culture such as advertising, news, etc. In pop art, material is sometimes visually removed from its known context, isolated, and/or combined with unrelated material. 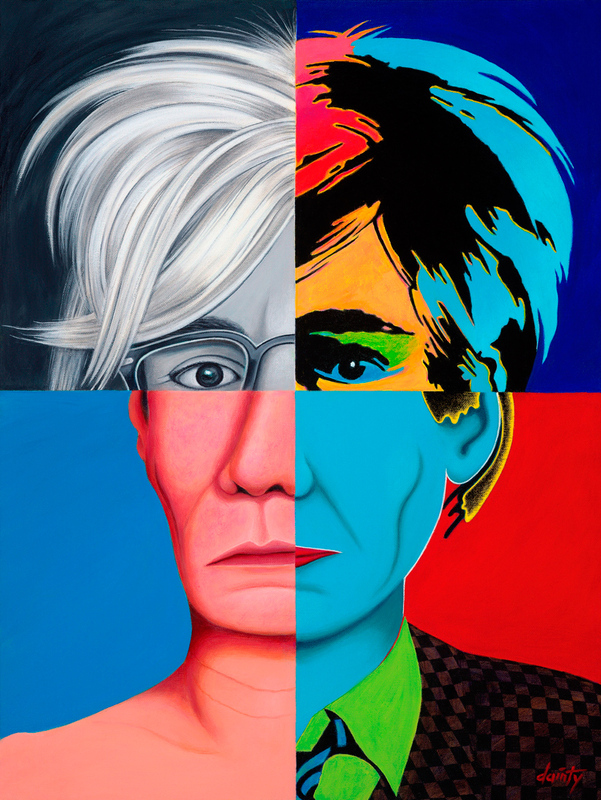 The concept of pop art refers not as much to the art itself as to the attitudes that led to it. Pop art often takes on its imagery that which is currently in use in advertising. Product labeling and logos figure prominently in the imagery chosen by pop artists, like in the Campbell's Soup Cans labels, by Andy Warhol. Even the labeling on the shipping box containing retail items has been used as subject matter in pop art, for example in Warhol's Campbell's Tomato Juice Box 1964. With the 6th graders, we discussed and looked at artwork from Andy Worhol, and discussed his impact on the Pop Art world. We also discussed a more current pop artist, Romero Britto. Born 6 October 1963, is a Brazilian-American Neo-pop artist, painter and sculptor. He combines elements of cubism, pop art and graffiti painting in his work. Consistently challenging himself, Britto has completed many corporate works for Movado, Disney, Enrico Coveri, Pepsi, the United Nations, BMW and Royal Caribbean Cruises. 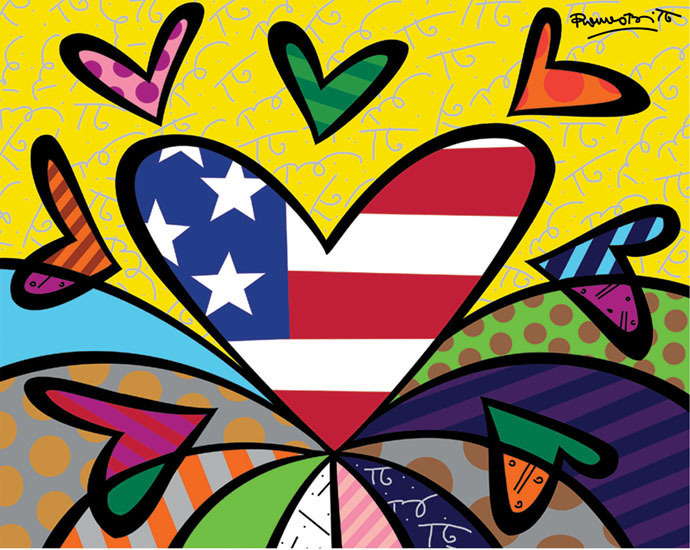 Britto has one main art gallery in Miami, on South Beach, FL. Our art lesson took on the elements of Pop Artist Romero Britto, emphasizing his loud, bright and colorful influence with bold shapes and lines. We spent some time looking at Britto’s work discussing his use of color, lines and shapes. This lesson was created by our Art Coordinator using elements of Romero Britto’s work. Using strong POWER WORDS (such as friendly, interesting, fun, social, athletic, etc) and INTEREST WORDS that describes their individual interests (such as soccer, math, reading, video, baseball, makeup, etc). Here we have artwork created by our 6th grade artists!! Materials: Watercolor markers, Black Sharpies, 12 x 18 white cardstock, 12 x 18 black cardstock, scissors and pencil. Medium: Black sharpies and watercolor markers. Prep Time: Including the taking of pictures, formatting into a document all the images and having them printed. Gathering materials. 1 ½ hours total.Reason for Lesson: Lesson addresses the Principle of Art as it relates to movement, and variety. The basic fundamental element of art used is line and color. This lesson can take a while to prep. Arrange to photograph each of the 6th grade students, could take one hour total. Take photos in black and white format OR change format to black and white post images. Create a document for each 6th grade class that includes a large 81/2 x 11 image of each student. Save on a USB and have it printed at Staples or Office Depot. Cost is approximately .10 per page printed. Submit receipt to Art A Baloo Leaders to reimbursement. Discuss the concept of pop art. 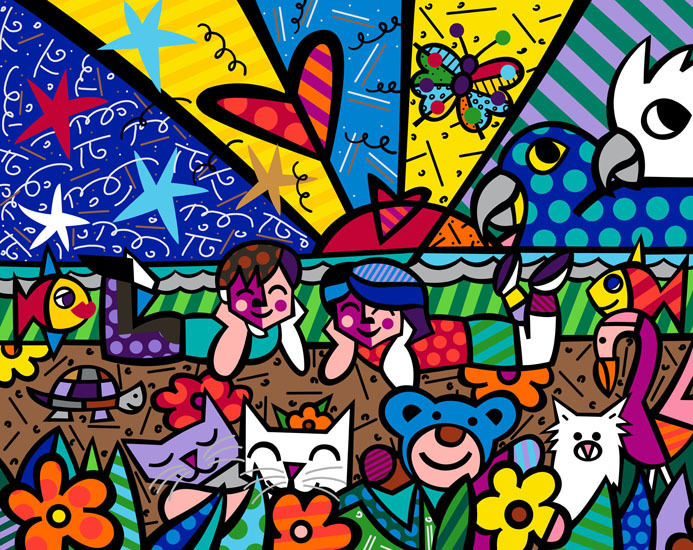 Features famous Pop Artists Andy Worhol and Romero Britto. The art lesson will take on the same affect as Romero Britto with bright color, dark lines and large shapes. Discuss the idea of lines and how they can be wide, thin, straight, curvy, dotted, etc. Spend some time looking at Britto’s work and have the students point out, as a class, the features of Britto’s art…loud, bright, colorful. EMPHASIZE that the shapes and lines should be LARGE and LOUD to get the same effect as Romero Britto. Make sure the students MINIMIZE the use of small items on their drawing. 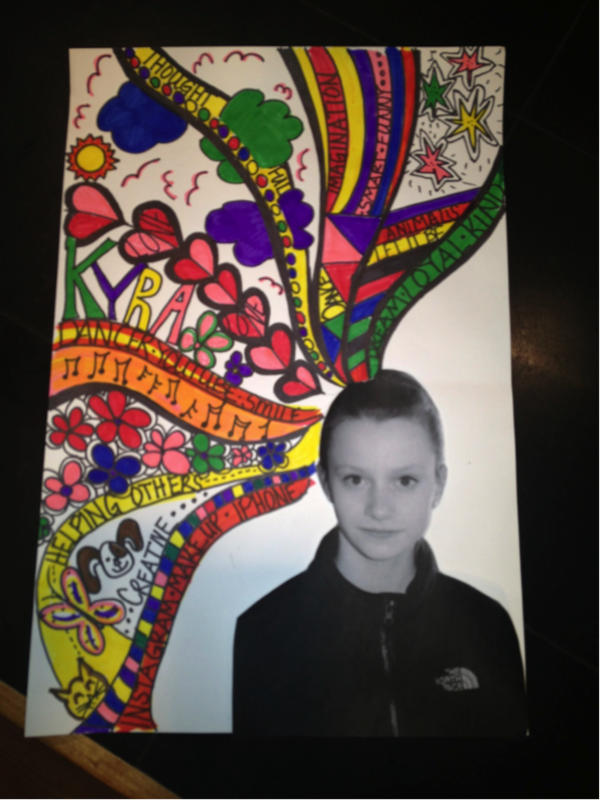 Provide a picture of each student (copied onto 8 1/2 x 11 paper) that was taken prior to the art lesson. Have the students cut out their entire body and lay the piece on the bottom right hand side of the white paper. Trace around the picture so you have a starting point for the lines. With a pencil, create random lines beginning from different areas of the head and extending randomly to the edge of the paper. Remove the picture and set it aside. Using a black sharpie, go over the pencil marking but NOT the outline of the head/body. Using the sharpie, begin creating random shapes and lines within the lined area. Create BIG, BOLD LINES and SHAPES. Add POWER WORDS and PERSONAL INTEREST WORDS randomly through the artwork. Along with creating lines and shapes have the students add POWER WORDS to describe themselves. Help the class come up with POWER WORDS. Ideas: Funny, Smart, Kind, Fun, Social, Thoughtful, Friendly, Capable, Interesting, Crazy, Athletic, etc. Words that help describe their PERSONAL INTEREST WORDS. Examples: Soccer, Volleyball, Swimming, Music, iPod, iphone, makeup, Football, Softball, Baseball, Reading, Math, Video, drums, violin, instruments, singing, etc. We will be cutting out the colored area and mounting colored area and ‘face’ on a black piece of construction paper. Credit: This lesson was created by PV Art Coordinator Deanna Haggerty with inspiration from artists Romero Britto and Andy Warhol. This is an excellent about a program and how it is presented to children to inspire their imagination and create art.